Freshly-cut grass hay on its way to storage. The quality of hay is affected by moisture, temperature and time. Quality begins to deteriorate as soon as the hay is cut, and it loses quality quickly under the best of storage conditions. Molds, bacteria and insects thrive under warm, moist conditions and consume many of the nutrients contained in hay. In addition, weather conditions and rodents can wreak havoc with stored hay. Under the wrong conditions, hay becomes dusty and moldy and unfit for equine consumption. 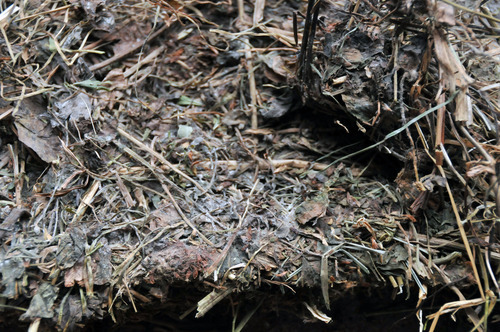 In turn, moldy, dusty, dark, brittle hay is not only unappealing to horses, but it is also dangerous to their health. Taking steps to make sure you are storing hay in the best way possible will save you time and money, and will also help assure good health for your horse. No matter where you obtain your hay, awareness of important factors related to maximizing the nutrient value of the hay you feed your horses is of great value. Whether you grow your own hay, purchase it from a local grower, or a feed store, it is important to know that the timing of baling of hay is critical for maximizing feed value. Most experts maintain that the optimum moisture content for baling is in the range of 15 to 20%, especially for alfalfa because leaf loss increases as moisture decreases. Indoor hay storage has advantages and disadvantages for both horse and horse owner. On the other hand, if hay contains more than 20% moisture, the chances for mold increase. Also dry matter and nutrient loss are increased, and more discoloration occurs. Microbial activity increases as moisture levels rise above 20% resulting in additional heat that creates more dry matter loss and in some cases can lead to destructive fires. Rain water can leach out soluble digestible nutrients and affect palatability, as well as cause anywhere from 5 to 50% dry matter loss. 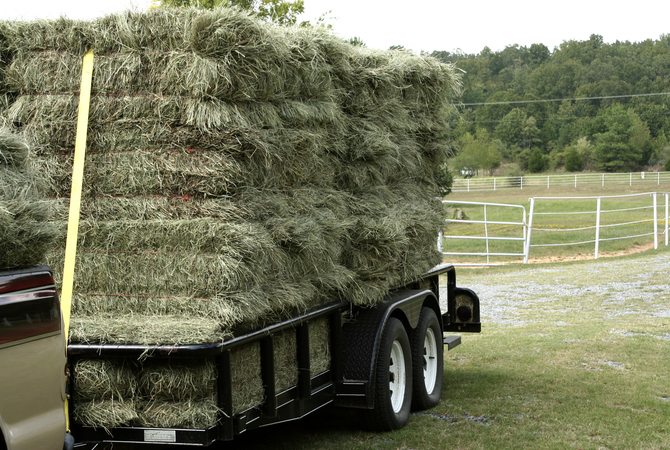 Storing hay properly whether outdoors or indoors is very important. Choose a well-drained, elevated storage site in a sunny location where frequent breezes occur. Choose bales or baling procedures that create well-formed, tight bales with a minimum of 10 pounds of hay per cubic foot in the outer inches of the bale. Place bales on pallets, coarse gravel, or old tires, rather than directly on the ground. This will prevent loss from penetration of ground moisture. Stack bales in closely butted rows with a gap between rows. This space between rows will allow for air circulation and sunlight penetration. Cover bales with heavy plastic sheeting, a tarp, or other fabric covering that is firmly secured to prevent wind from blowing it off. Leave flat ends of outside bales, as well as a few inches along the sides of rows, uncovered to allow moisture to escape and air to circulate. Make sure that no objects are near hay that would attract lightning. Reduce the fire risk with a non-vegetation zone at least 3 feet in width around the storage area. Feed hay stored outside before using hay stored inside. Stack bales so older hay will be fed first to preserve feed value. 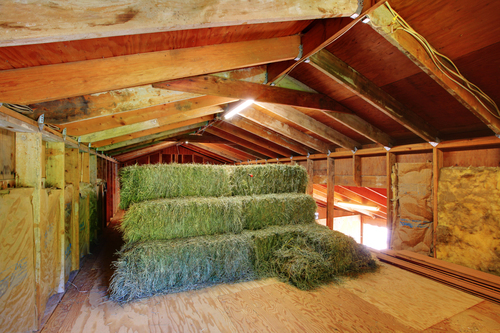 Hay maintained indoors is generally more accessible, and maintains higher quality than outdoor stored hay. Some older barns may have loft storage that can be used for hay. Because of dust and air quality issues, the use of loft hay storage is not generally recommended. Also, hay stored in a loft poses an increased fire hazard. Keep the hay dry by making sure no roof leaks or water drainage problems can affect it ,and minimize or channel away any condensation that might accumulate on the inside of the roof. Stack hay for maximum air flow. Bales should be stacked in closely butted rows with a gap between rows for air circulation. Keep bales in compacted state so open hay is not exposed to air that will cause it to lose quality. Rodent proof your storage area by plugging possible entrances with steel wool and keeping an eye open for signs of rodents that might contaminate your hay. Reduce fire risk by storing hay at proper moisture levels around 18% and by stacking bales so adequate air movement and ventilation can occur. Stack hay so older hay is used first. When hay with 20% or more moisture is stacked tightly, the growth of organisms that generate heat can increase hay temperatures to the point that chemical reactions occur, resulting in fire danger when the temperature exceeds 150 degrees F.
Monitor the temperature of your hay if you suspect heat is building up by driving a 1/2 to 2 inch pointed pipe into a hay bale. Tie a thermometer to a piece of string and lower it through the pipe. Wait 10 to 15 minutes for the thermometer to register an accurate temperature, then pull it out and read the temperature. Test several bales in this way. If you don't happen to have a thermometer available, simply drive the pipe into the bale and remove it after 15 to 20 minutes. If the pipe is too hot to touch, the fire danger is critical. If the temperature is below 140 degrees F, and you can comfortably hold the pipe, little danger exists. If the temperature is between 140 to 160 degrees, check bales often. Once the temperature reaches over 160 degrees, remove the bales to the outside away from the building and spread them out to cool. If the temperature rises to 180 degrees, move all animals from the area, call the fire department and remove bales to the outside. If bales ignite, soak with water, forcing the water into the center of the bales. Once the interior temperature of the bales is below 100 degrees, it is safe to move the hay back into the storage area. By taking time to assess your hay storage situation and making necessary adjustments, not only will you prevent dry matter loss and maintain forage quality, but you will also save time, effort, and money, along with having healthier horses.